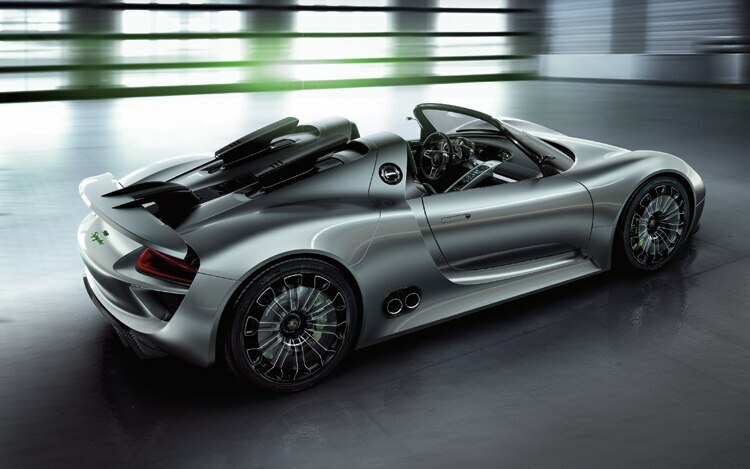 It took 110 years for the Porsche car company to revisit its founder’s concept of a hybrid powertrain with an internal-combustion engine plus electric motors. 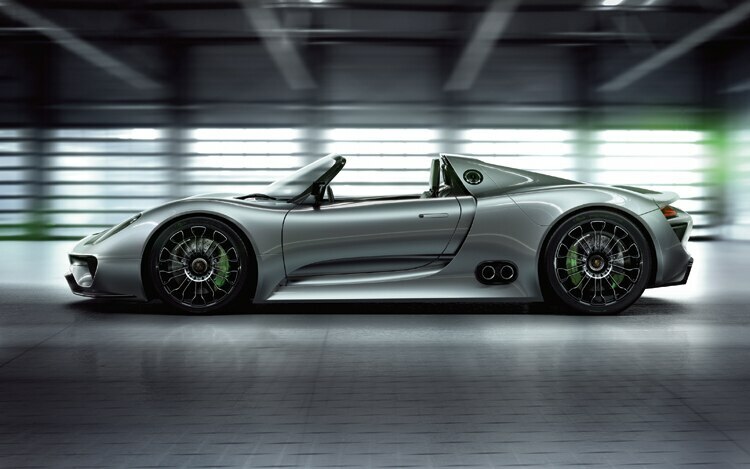 The Porsche 918 Spyder is one of the most astonishing concept cars ever presented, by anyone. To claim — and be able to prove, no doubt — that this missile can get around that crinkly old racetrack in the Eifel mountains faster than a Carrera GT and provide 78-mpg fuel economy (if you respect speed limits) is utterly amazing. Yet, given the source, it’s much easier to believe those claims than to question them. The irascible Professor Porsche had finally burned all his bridges to the German motor industry by 1931 and was forced to open his own independent engineering design consultancy seventy-nine years ago. Since then, there have been only five Porsche styling leaders. Austrian Erwin Komenda shaped the Volkswagen Beetle and its Berlin-Rome sports derivative, the magnificent Cisitalia grand prix car, and the iconic 356. He also worked on the 911, credited to fellow Austrian Ferdinand “Butzi” Porsche, Komenda’s successor, who was quickly followed by Latvian-born American Anatole Lapine, then Dutchman Harm Lagaay, and now, for the first time, a German, Michael Mauer. 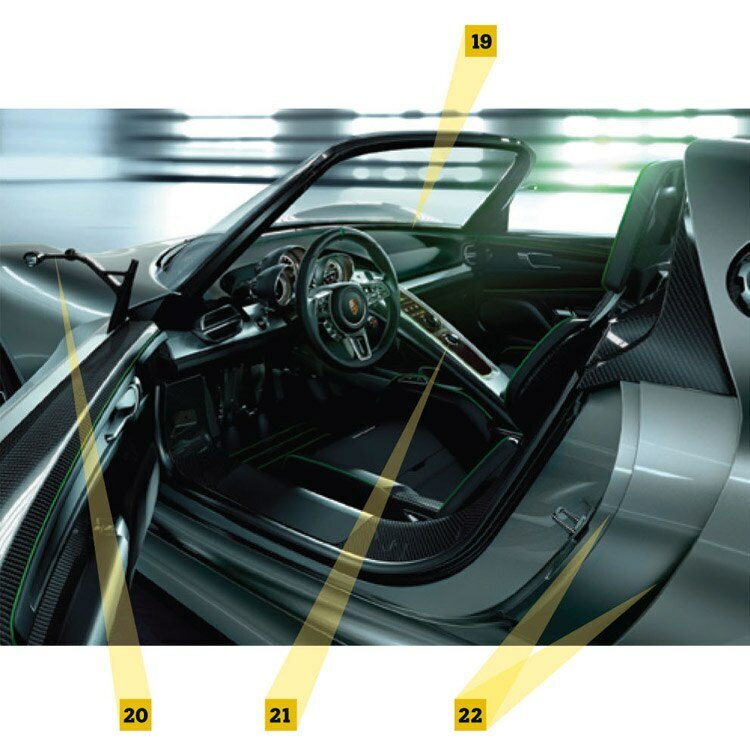 Each of the last three men has contributed something outside the Komenda template: Lapine the 914, the 928, and the 944; Lagaay the Carrera GT; and Mauer the Panamera. 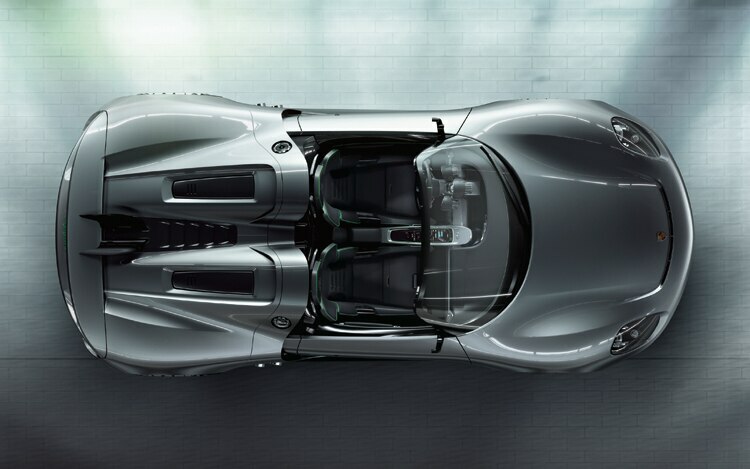 Mauer, despite what you see when you look at the bloated back of the Panamera, is a very good designer, and with the 918 Spyder he and his team have truly broken away from the Komenda canon while still respecting it and the variations that followed. The headlamp openings are no longer round or oval, the front accepts the fact that there are radiators needing large amounts of air, and the profile still falls away in a fastback manner, although the deck is substantially flat between the headrest fairings. The turned-down rear wing picks up a cue from the Lapine 959, but the composition is totally different. It is said that future Porsche cars will be influenced by the 918, and I can believe that because the 918 itself has about twice as many good styling ideas as it needs, and no doubt they’ll eventually be used — but not all at once, as here. The overall impression is much more related to racing Porsches than to past road cars, all of which had more monolithic forms. Here the body profile is definitely dictated by the wheels, giving a voluptuousness that is made manifest in the top view showing that the nose and sides form an almost perfect circle. You can’t get any more Rubenesque than that. Porsche has already said that it would need 1000 orders to justify building such a high-performance hybrid and that a production version might appear as a coupe and/or as an open car. Three months after the initial surprise showing, some 900 of the faithful had made their desire known. 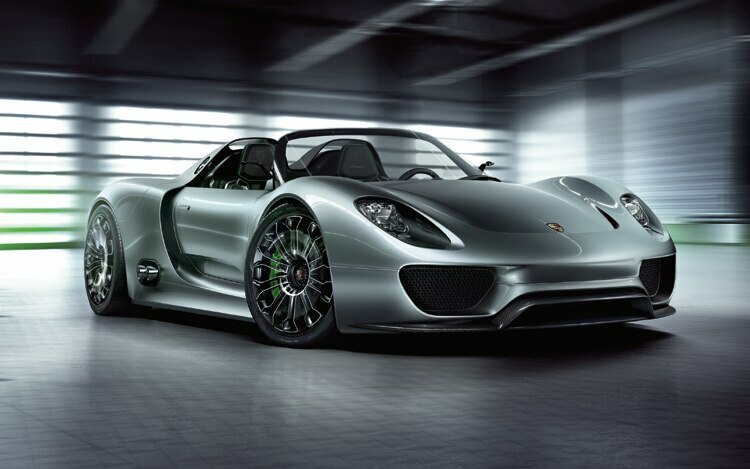 I’d bet there are three times that many who will buy 918s. 1. Yes, Ferrari was there nearly fifty years ago, and McLaren did much the same twin-inlet design on the F1. And why not? It is perfectly logical. 2. This separate carbon-fiber molding gives definition, but it is so low as to be seriously vulnerable in normal road driving. 3. Little indents for the headlamp covers provide visual structure to the front end. Contrast this with the fat forms of earlier Porsches. 4. The entire rear body is larger than the front, effectively becoming a huge scoop. Its leading edge profile parallels the graceful door cut, while a door indent channels more air to the engine bay. Count on the exhaust coming out the back in production, though. 5. Pierced transparent wheel covers are high on decoration, null for practicality. How do you clean brake dust? It’s hard enough to get it off aluminum wheels that don’t scratch so easily. 6. 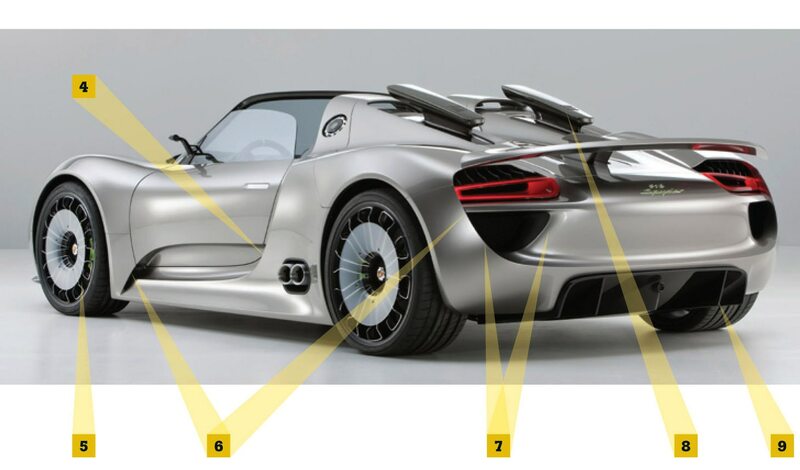 Not only are these knife edges unusual for Porsche, the lines result in sharp points both behind the front wheel housing and at the outer edge of the rear cooling outlets. 7. The sharp trailing edge of the rear fender sweeps gracefully across the entire rear of the body. It’s a little surprising that there is no clearly delineated license-plate position. 8. Shades of Jaguar’s levitating shift dial. These scoops apparently rise above the surface as needed (and as shown here), rather like the rear flaps on other Porsches. 9. Everyone must have a diffuser, functional or not. Count on this one working. Hard. 10. This is the approximate center of an almost-perfect circle circumscribing all surfaces ahead of the doors. There is a tiny point on the bumper, but not on the outlet slot . . .
11. . . . which is concentric with the perimeter of the whole. 12. The convex outer surface of the headrests changes abruptly to a concave descent toward the scoop indents, establishing a sharp profile line. Again, artful and elegant. 13. This knife edge is dramatic and dynamic and would work extremely well on a coupe, too. 14. 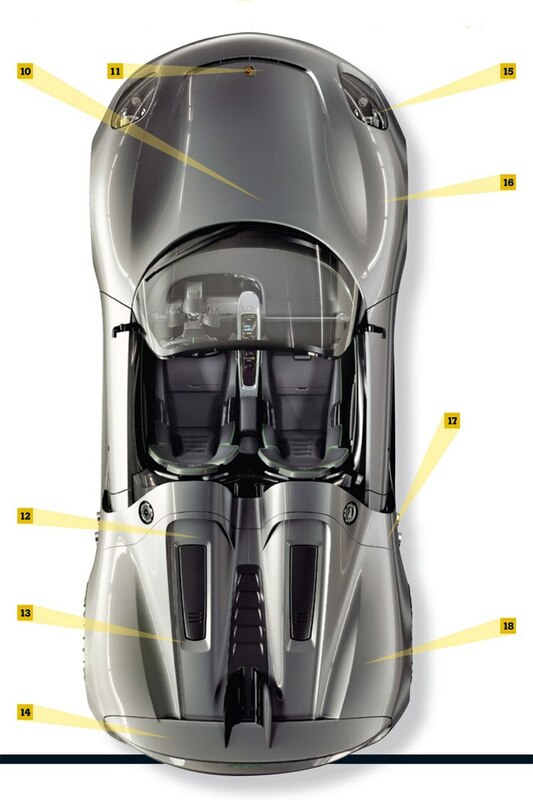 The fixed, freestanding rear wing turns downward at the tips, recalling the integrated wing of the 959 supercar. The elliptical trailing edge is both pretty and aerodynamically efficient. 15. Very nicely shaped headlamp covers recall Italian racers more than Volkswagen/Porsche 356 lights. 16. These crisp peaks on the fenders break sharply with Porsche surface traditions. 17. Notice the complex cutline between the center body and the tail cover. Every cutline on the body is elegantly artful, especially on the aft ends of the doors. 18. Another sharp surface change on the rear fenders gives direction and avoids the pudgy look of early Komenda designs like the 356. 19. The circular theme in plan view is carried across the instrument panel just at the intersection of the windshield base. 20. A very science-fiction sideview camera will have to come eventually. The technology is ready, even if the auto industry is not. 21. What?! No shift lever? Not really needed with the dual-clutch automatic gearbox. And there are paddles. 22. Beautifully coordinated curves for the body-side scoop and the door cut.